The money will be held in an escrow account subject to an appeal by Ireland. 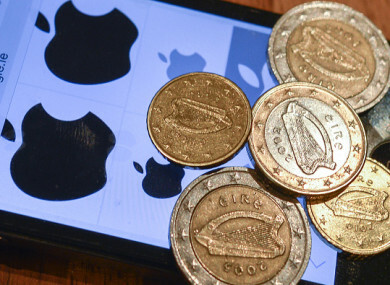 The EU found that Apple owes Ireland €13 billion in back taxes. THE STATE HAS chosen the financial institution that will hold onto the billions of euro in back taxes the EU Commission says Apple owes to Ireland. The Bank of New York Mellon, London Branch has been selected as the preferred bidder for the role by the National Treasury Management Agency. The decision was made following a tendering process which began last year. The EU Commission ruled in 2016 that Ireland gave multinational tech giant Apple illegal state aid worth up to €13 billion over a decade. The Department of Finance is appealing the decision because it denies that there was any sweetheart deal in place. Despite the appeal, Ireland is obliged to collect the funds and hold them in escrow until the appeal process is concluded. The size of the funds could be between €13-15 billion, including EU interest. The department announced this morning that BNY Mellon will operate the multi-billion euro escrow account. “Over the coming weeks, the State and Apple will be working with the preferred tenderer to finalise the contract and operational arrangements for the escrow,” the department said. “A separate procurement process for investment managers for the recovery amount is currently in progress,” the department added. The EU Commission had previously complained that Ireland was “taking too long” to recover the funds from Apple. Email “We now know who'll be holding onto the Apple billions that are destined for Ireland”. Feedback on “We now know who'll be holding onto the Apple billions that are destined for Ireland”.